ns2.tigertech.biz, ns3.tigertech.org, and ns1.tigertech.net are its DNS Nameservers. It is hosted by Tiger Technologies Llc (California, Berkeley,) using Apache web server. 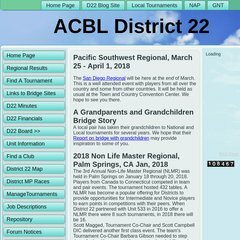 Acbldistrict22.com's IP address is 208.80.4.104. PING www. (208.80.4.104) 56(84) bytes of data. A ping to the server is timed at 44.2 ms.